Lest you think I’m a one-trick polo-coated pony, I thought I’d throw in these photos of me on the way to a friend’s photography exhibition last Friday night. The topcoat is black cashmere, bought by my father in Kowloon, H.K. I’m not sure if it is MTM or off the peg. But it fits me nicely and has seen me through many an evening. It is less voluminous than my polo coat and in its two button stance, notched collar and shorter length, it is an enduring classic. The rest…. 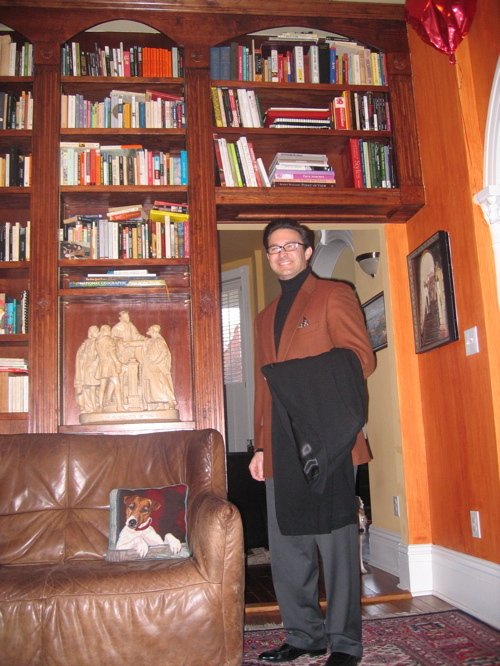 black cashmere turtleneck, rust cashmere blend odd jacket worn with a tan and black silk pocket square, slate grey flat front trousers by Zanella and my black, Venetian loafers from Martegani. If it were a club this evening, dark denim jeans would work just as well. As close to Mod as I’m likely to get, at any rate. Where is The Cappuccino Kid when you need him most? 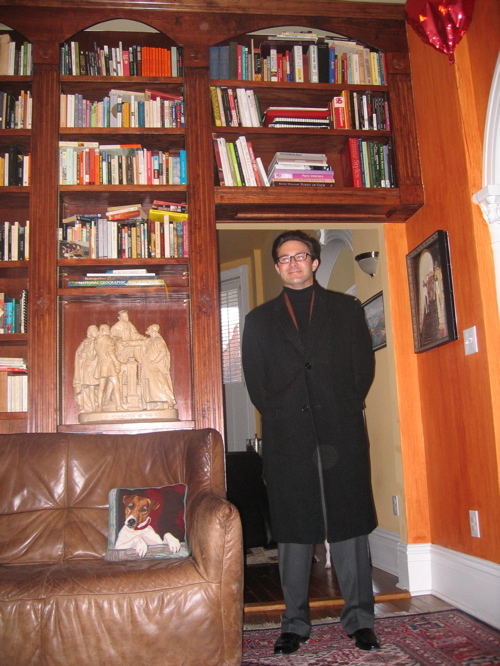 This entry was posted in Elegantology and tagged casual clothing, topcoat. Bookmark the permalink. trousers are a bit too long, don’t you think? I swear, my b-i-l had a coat on yesterday that i know you would have KILLED for. Hello and welcome PSA, I have to take a trip to the tailors. I’ve hit my weight loss goal earlier than anticipated (and my running mileage.) No matter how tight I cinch the belt, my trousers are slipping to rest on my hips. It bugs me, too. Delicious colour on that jacket! And I meant to tell you that I do like the strie effect on the walls. Much more depth than the flat, don’t you think. I still bet the room looks wonderful in the evening. I must say, I do like this coat better than the camel. It seems to fit much better. Thank you Pamela. There are mistakes, but the walls are growing on me. It does really well in dim light. Turling, thanks. It fits differently. It’s closer cut (1960’s) is more in vogue today. The fuller cut of the camel DB (1980’s) was a throwback to the 30’s. I love them both, but for different reasons.